Join in! To become the most famous youtuber! To stun millions of audience with your great talent! And to create incredible shows with fun and joy! 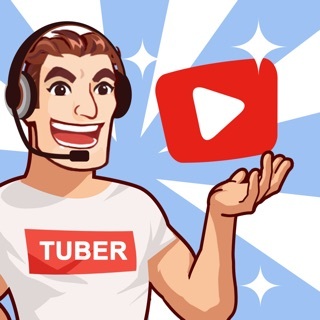 Even as a nobody, you have a golden chance to join the tube and become a successful tuber! With diligent efforts and potential talents, you will rock the world and win the fame. Huge fans, big name and great studios are waiting! Tap to create as many videos as you can, which is the only best method for you to gain great popularity and money as well. Speed up the progress bar by increasing the numbers. Additionally, hiring some side jobs and making upgrades to your equipments are good helpers to accelerate your popularity. Drop off hesitations and move it! Tube Tycoon has prepared a stage for you to show! I just started this game today and I’m already loving it. The concept of the game is good. But you could really make more realistic and make it so if you do something wrong you should lose views or subs. For example, if you make a video on memes and you make the name of the video or the thumbnail doesn’t match the theme of the video, you should lose a couple subs or money. But, other than that the game is really good. Well, hope the creator or creators can change some things and make the game better in the future updates. Thanks for the game by the way creators, you did a very good job. I love the game, and the concept is pretty fun as well, but one problem. Sometimes when I watch an ad, it freezes at the end and won’t let me return to my game, meaning it’s a scam, the reason I say this is because I don’t get my reward for watching it, making it a waste of time. Like I said, a really love the game and the gameplay itself, but that one problem stands out so if you can fix it I would change my rating to 5 Stars, because without that bug, it’s perfect in my eyes, except for how much Xp is required to level up but, I just have to be patient I guess. It’s okay, but there’s some problems. The overall game is good and all, but the graphics quality for all the videos always sets itself to 720. The video stats also show the video length to be short and live action. I keep trying to reset it to other options, but it always shows as live action and short length. Idk if this is because I’m only starting the game and I’m level 4 and I can’t do anything until I level up, or if it’s actually just the game itself. But it’s not helpful for the videos. Plz fix this issue if u can. Also, WAY TOO MANY ADS!! It’s annoying. Cut the ads a bit plz.